IBackup provides an easy, secure and reliable way to restore individual emails from a Personal Folder (.PST) file to the MS Exchange Server Store through the 'Exchange Brick-Level Mailbox Restore'. The application restores the contents of the selected Personal Folder (.PST) file to a corresponding Exchange Server Mailbox. 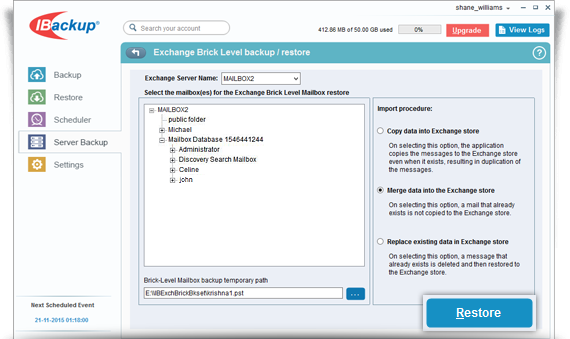 IBackup 'Exchange Brick-Level Mailbox Restore' is designed to restore individual emails from a Personal Folder(.PST) file to the selected Exchange Server Mailbox. This is not a method for the complete recovery of the Exchange Server databases. Use the 'Exchange Server restore' feature of the IBackup application to perform complete recovery. Locate and select the personal folder (*.PST) from the ‘IBExchBrick’ folder in your IBackup account. Browse and select the .PST file from your local computer (the location where the folder was restored earlier from your IBackup account).